I can’t say that most diabetes educational materials for kids get me too excited. But when I received an email from Lilly Diabetes with two images that have been under wraps until their announcement at the 2011 Children With Diabetes Conference, I have to say I got a few tears in my eyes. 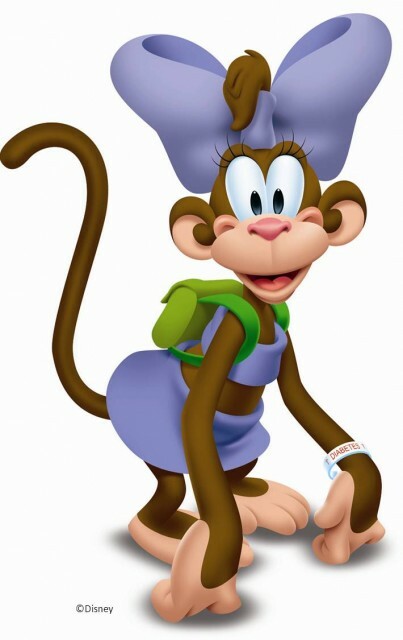 First, when Q looked at Coco, I told her to look at the monkey’s bracelet. Her jaw dropped. Literally. Even my non-D child wants to get his hands on the book. His recent birthday party had a Mickey Mouse Clubhouse theme. Because I had the image of the book on the screen and I took a closer look. Coco wears a bracelet, just like my daughter. She wears a backpack that surely is full of D-supplies, just like my daughter. And there is CAKE on the table, which surely she can eat, just like my daughter! 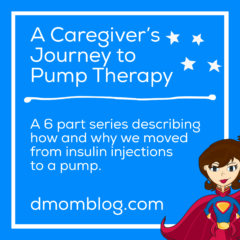 When my daughter was diagnosed with diabetes, she had three birthday parties to attend within two weeks of being sprung from the hospital. I remember asking the nurse what I was supposed to do. Was I supposed to rescind our RSVP’s so that she wasn’t exposed to cake? Was I supposed to take some alternate low carb “treat” for her to consume? What was I supposed to do?! Let her be a kid. I was told to go to the parties, let her eat the cake, and give her insulin. And I have gotten quite good at estimating boluses for birthday cake, cupcakes, and ice cream. The partnership will be one of information, dialog, and how to’s. 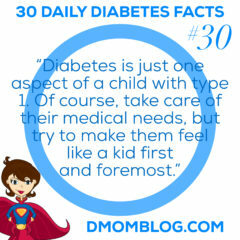 It has a positive message of what children with diabetes and their families can do, not what they shouldn’t do. Something that Matt said in our conversation resonated with me, that medicine is a small part of success with diabetes. That it’s not about the medicine, it’s living life with diabetes. The new partnership has three aspects. 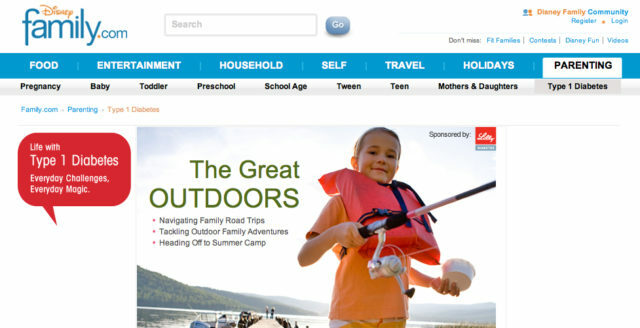 The online component is a section of the Family.com site operated by Disney that is devoted entirely to diabetes. It will be updated monthly with seasonal topics. I took a look at the site and thought that it was a good start. I especially thought the printables for carb counts were cute! 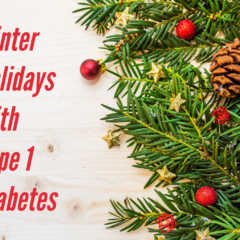 The site will include dialog from two sisters who each have a child with diabetes, as well as information relevant to the time of year. For instance, there is info about camping right now. When you click on the parenting tab, you will see “Type 1 Diabetes” on the right. 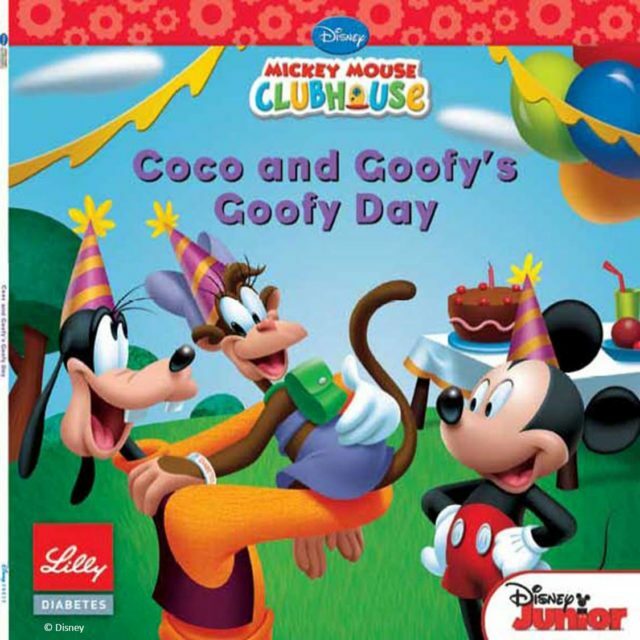 The second aspect of the partnership is with Disney Publishing and includes the Mickey Mouse Clubhouse book shown above. It was my impression that there will be additional titles in this series featuring Coco. In this book, Coco who is newly diagnosed with diabetes is invited to Goofy’s birthday party. The message of the book is that, of course she can go to the party (and so can your child) and have fun like all the other kids. 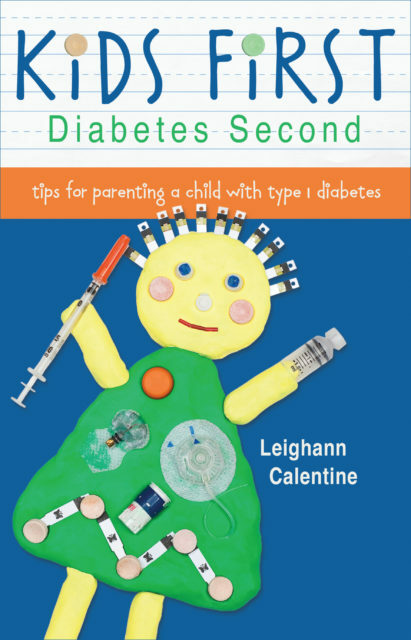 Because children can be diagnosed with diabetes at any age, they will also be be publishing tween novels (chapter books) geared toward middle school aged children. There will be a series for girls and one for boys. The first two books will focus on participating in sports. There will also be a Type 1 cookbook with a Disney theme and will include gluten-free recipes. Lastly, they’ve worked with Birnbaum to create a Disney travel guide that is specific to diabetes. They handed these out at the CWD conference held at Disney this year. They will be distributing the Mickey Mouse Clubhouse books to healthcare providers (for instance pediatric endocrinologists) for distribution to patients at no charge. Will there be a Coco plush? Not in the foreseeable future. 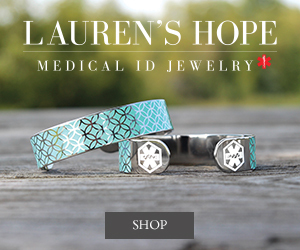 But wouldn’t that be awesome for a child to receive at diagnosis! Images courtesy of Lilly Diabetes. Disclosure: I was not compensated in any way by Lilly Diabetes or Disney for this post. I will receive materials, including a copy of the book, to use for editorial purposes. Please read the disclosure statement. This character and it’s development sounds so wonderful fornour kids. There is nothing like this out there for them, not counting Rufus, and frankly, he leaves a little to be desired. This is the full character and so many ways they can take it, such positive reinforcement for our kiddos. Thanks for sharing what they have so far. That’s exactly why a Coco plush would be so great. Q loves Rufus, but he’s kinda old fashioned. He came to us when we really needed him and got us through a rough patch shortly after diagnosis. Though I will say that darn book makes me cry at the end every time I read it to her! Any ideas where I can get a book or plush of Coco? I don’t see on Disney if any of the products are out yet? I don’t think they have any plans for making a plush Coco, which is silly because I know lots of people who would buy them! The books are being given out by pediatric endocrinology practices. Ask the next time you have an appointment. Some of the children’s hospitals may have them too. They are no charge for children with diabetes and they are actually not for sale anywhere. Coco is a cutie pie! LOVE that! What great news and a wonderful partnership! My daughter did love Rufus (she LOVES bears though), but she also got this purple dog we ended up naming Smurple the Purple Pup and it really helped her through those days in the hospital. I think Coco would be even better for kids! I SO want a copy of that book! I showed Caylin Coco and she just thought she was so cute and was excited! 😉 I think that advice you got, “Let her be a kid” is the best advice. I often tell myself the same thing. Will the books be available to purchase for our kids who are already diagnosed and didn’t/wouldn’t get one at diagnosis? So cool! Love that Disney is helping people learn what MWD (and CWD!) CAN do instead of focusing on the can’ts! I know! I wanted to go too! We WILL attend CWD conference in the next few years. Need to start saving my pennies. Thank you for bringing us the great news and all the fabulous information you provided, Leighann. Well, I knew about it before I saw Coco on your site, but you gave the best intro and info!!!!!! Ah, shucks! Thanks for the compliment. 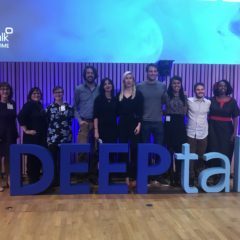 I learned a lot about the initiative when I talked with Matt and wanted to share what I learned. Love it! Where and when can we get one??! Ask your ped endo. They are being distributed for free through providers. We are just getting started on our diabetes journey, and I LOVE this!! Thank you so much for the post. I just started typing up recipes today, planning to let my T1 daughter decorate a binder to organize them in, and the printable from Disney will help make it an even more fun project for her, too! We are so blessed by the work others have done to pave the way for our family! 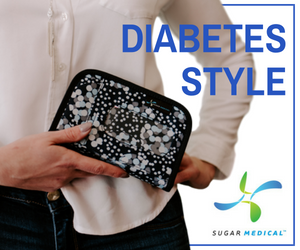 Tonya, I always say “No reason to reinvent the wheel!” I find it so helpful to learn from others who have gone before us and figured out a thing or two about how to manage diabetes. Do you know if Lilly will be distributing them in the uk too? again, this is just a wonderful and creative idea. Love the idea. Wondering if someone over at Wilton will consider doing a “Coco” cake mold for kids’ parties (they already do a number of Disney-licensed themes and molds). A series aimed at tweens (10-14) probably needs main characters in the 13-15 range, and one aimed at teens (13-17) probably needs characters in the 15-18 range (need one who is not yet old enough to drive). General rule: slightly older characters become role models more easily than same-age or slightly-younger ones. OTOH, IIRC one set of Bobbsey Twins (which series I’ve never read) were younger than the target audience. Also, IIRC the Hardy Boys were same-age or a bit older than their target audience, and Nancy Drew and her friends were considerably older. Subjects for the tween/teen audience should include care at school, bullying, dating, driving, and drugs. This, too, brought me to tears. I am a T1 just diagnosed 2 months ago as an adult (at the age of 33). My brother was diagnosed 3 months ago as an adult (at the age of 31). I’ve never been a HUGE Disney fan, though I do love Disney; but this has tipped the scales in a MAJOR way! I would LOVE to have a plush, a keychain, stickers, you name it…with CoCo on it!! I would display it on my car, on my cell phone, in my office–wherever I am!!! I’d love to have a way to contact Disney to get them to consider appealing to “us” by creating the opportunity to purchase the plush animals to fund research. Let me know if someone has already started that train and I’ll be glad to buy a ticket!!! ON BOARD!!!!!!!!!!!!! !